Hemorrhagic lesion in Gianotti-Crosti syndrome is rare and always localized. The disease commonly involves preschool children. Skin manifestation is usually preceded or accompanied by mild constitutional prodrome of slight rise of temperature, lassitude, and signs like lymphadenopathy, most commonly involving axillary and inguinal area. Disease is generally asymptomatic, except occasional mild pruritus. Disease heals with desquamation and slight hypopigmentation that also improves after few weeks. Commonly affected is the pre-school age group. There is a preferential incidence pattern during spring and early summer. Role of precipitating viral infection is convincingly suggested in numerous occasions. Here, we report an unusual case of Gianotti-Crosti syndrome in a very young infant aged one and half months. Most noticeable presentation in the case was predominant presence of hemorrhagic vesicles. Investigation suggested etiological role of Epstein Bar virus (EBV) infection. A male infant, aged one and half month born vaginally at term following uneventful pregnancy, weighing 2.9 kg at birth and 4.5 kg at presentation, on exclusive breast-feeding, was hospitalized with remittent, moderate fever of 7 days duration and hemorrhagic papulovesicular eruptions for 5 days duration. The baby was found non-toxic. Bowel and bladder function was normal, and the baby was sucking well. Eruption rapidly involved all 4 limbs and face. 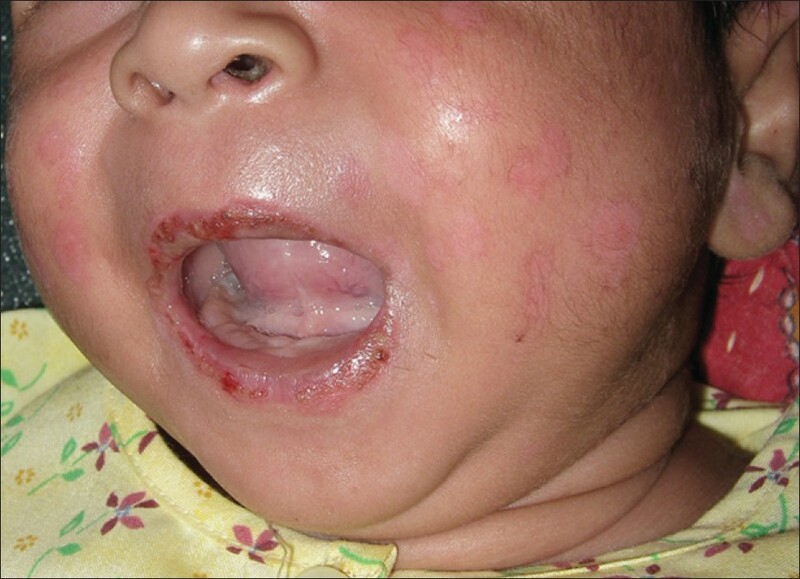 There were extensive hemorrhagic vesicles along with papules over hands, feet, lower and upper limbs (mostly on extensor surfaces), face, and lips but sparing other parts of the oral mucosa [Figure 1] and [Figure 2]. There was no icterus or significant lymphadenopathy, but moderate pallor was present. There was mildly enlarged soft spleen (2 cm) and liver (2.5 cm) as found on palpation of abdomen. Peripheral blood examination showed low hemoglobin concentration (Hb-8.8%), leukocytosis (20800/cmm) with lymphocytosis (Neutophil-30, Lymphocyte-64). Characteristically, 26% of the total lymphocytic population showed atypicality (mostly plasmacytoid form, a few were monocytoid form) and normal platelet count (2.4 lacs/cmm). Liver and renal function studies and urine examination revealed no abnormality. HBsAg was negative. IgM antibody against Epstein Bar viral capsid antigen (VCA) was significantly elevated (IgM-31.51 U/ml, reference range: 0-8 U negative, 8-12 borderline). A diagnosis of Gianotti-Crosti syndrome was made, and causative role of EBV was suggested. Patient was treated conservatively with symptomatic measures. Rash started improving from 6 th day of admission and resolved completely with mild hypopigmentation and scaling by 11 th day. [Figure 3]. PAC may represent a group of parainfectious exanthem. Most possibly, viral infection-induced indirect immune stimulation plays the key role. Most of the initial work suggested hepatitis B virus (HBV) as the etiological agent. Anicteric hepatitis and significantly raised hepatic transaminases (1000-2000 IU/ml), a feature that is rare with other etiologies, are evidences in favor of HBV-induced PAC. Antigens most frequently detected were 'ayw' and 'adr' subtypes. However, this initial suspicion was not sustained in more recent observations from United States, Italy, and Japan. Currently, EBV is considered to be the most common etiology of PAC. Coxsackie virus, cytomegalo vurus, respiratory syncytial virus, HHV-6, parainfluenza virus, parvovirus B-19, polio virus and vaccines for MMR, DPT, Japanese B encephalitis, oral polio vaccine and even HIV infection were also implicated as causes of PAC. Papular urticaria, Henoch-Schönlein purpura (HSP), immunobullous diseases, erythema multiforme, acrolocated pityriasis lichenoides, and hand-foot and mouth disease (HFMD) may clinically mimic PAC, but clinical distinction may not be difficult. HSP is characterized by successive crops of larger lesions, which are found over lower limbs and buttocks in older children with prominent systemic symptoms like abdominal pain and joint pain. The present case lacked all these features. 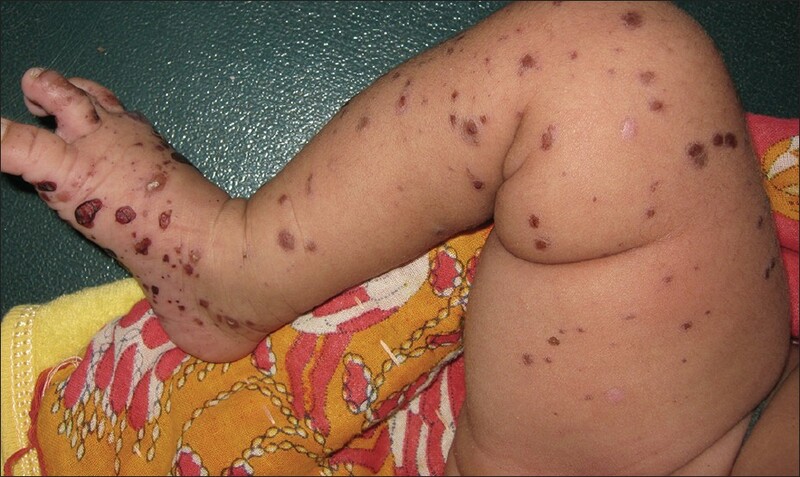 Distribution, characters of individual lesions, clinical course, and examination finding were not suggestive of any of the bullous diseases seen at very early ages like chronic bullous diseases of childhood, childhood bullous pemphigoid, herpes gestationis and HFMD. Absence of targetoid lesions ruled out erythema multiforme. In a study done on more than 300 patients of PAC, the most commonly affected age group was 6 months to 14 years with a mean of 2 years. The present case highlighted the vulnerability of even younger age-group. Reporting the present case was important for two reasons. One was obviously the extremely young age as mentioned previously. This could well be the youngest one with PAC reported so far in literature. More important was, however, the presentation with widespread purpura. Purpura is rare and usually involves limited area. Occasionally purpura had been reported to be induced following application of tourniquet. Till reporting this case, widespread hemorrhagic vesicles as was noted in the present case was not reported. Investigations ruled out any platelet abnormality or presence of bleeding diathesis in the child. However, rapid recovery without any complication indicated that widespread hemorrhage might not be a poor prognostic marker. 1. Gianotti F. Rilievi de una particolare casistica tossinfettivacaratterizzata da eruzione-infiltrativa desquamativa a focolai lenticolari, a sede elettiva acroesposta. G Ital Dermatol Sifilol 1955;96:678-97. 2. Crosti A, Gianotti F. Ulteriore contributo alla conoscenza dell'acrodermatite papulosa infantile. G Ital Dermatol 1964;105:477-504. 3. Paller AS, Mancini AJ. Exanthematous diseases of childhood. Paller AS, Mancini AJ, editors. In: Hurwitz clnicial pediatric dermatology. 3 rd ed. China: Elsevier Saunders; 2006. p. 423-48. 4. Fölster-Holst R, Kreth HW. Viral exanthems in childhood. Part 3: Parainfectious exanthems and those associated with virus-drug interactions. J Dtsch Dermatol Ges 2009;7:506-10. 5. De Gasperi G, Bardare M, Costantino D. Au antigen in Crosti Gianotti acrodermatitis. Lancet 1970;1:1116-7. 6. Hofmann B, Schuppe HC, Adams O, Lenard HG, Lehmann P, Ruzicka T. Gianotti-Crosti syndrome associated with Epsein-Bar virus infection. Pediatr Dermatol 1997;14:273-7. 7. Caputo R, Ackermann AB, Sison-Torre EQ. Gianotti-Crosti syndrome. 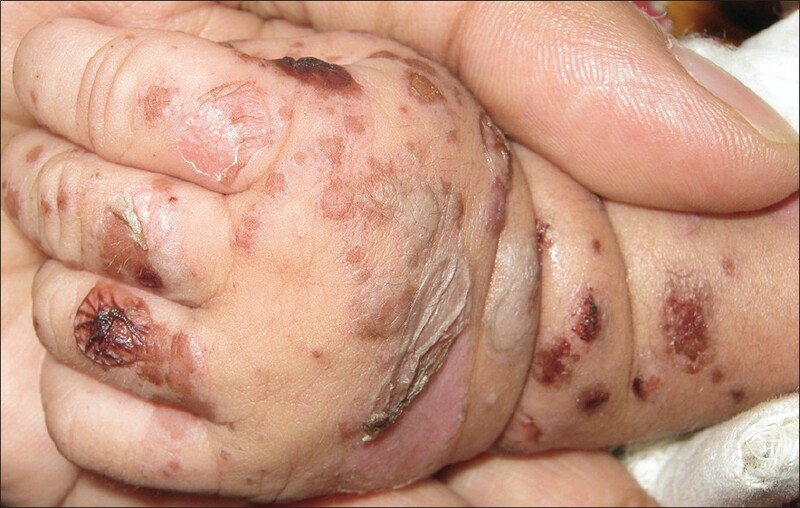 In: Pediatric Dermatol and Dermatopathology. Philadelphia: Lea and Febiger; 1993. p. 399-410. 8. Caputo R, Gelmetti C, Ermacora E, Gianni E, Silvestri A.Gianotti-Crosti syndrome: A retrospective analysis of 308 cases. J Am Acad Dermatol 1992;27:207-10. Gianotti-Crosti syndrome may present with extensive hemorrhagic lesion and may involve infant of less than 2 months age.